Commenting on the war, Henry Kissinger famously remarked, “Too bad they can’t both lose.” Sparked by simmering land disputes over the Shatt al-Arab, Saddam Hussein sought to establish Iraq as a true regional power, and also check the export of Shia fundamentalism from Iran. Initially, Iraq scored limited gains, but Iranian forces rallied and began a counter offensive into Iraq. Without set allies in the conflict, the United States played a cynical game of attempting to keep both sides sufficiently supplied for the war to continue. Ultimately, the US began to tilt to Iraq as an Iranian victory in the war would have been an unacceptable outcome. Iran also utilized oil as a weapon necessitating the US flagging of Kuwaiti tankers to ensure oil supplies. After 8 years of war, the border returned to its ante bellum status. However, both nations had been severely weakened by the conflict. Towards the end of the game, this area’s countries are usually dominated by the same superpower, and so the odds of Iran-Iraq War succeeding are rather low. Unlike earlier Wars, it’s not commonly played for the Mil Ops, since by this point you should be able to find a non-battleground to coup with the card itself. Iraq is typically a more popular target, because its neighbors (Iran/Saudi Arabia/Jordan/Gulf States) are usually less filled than Iran (Iraq/Afghanistan/Pakistan), and because it is a higher stability country. 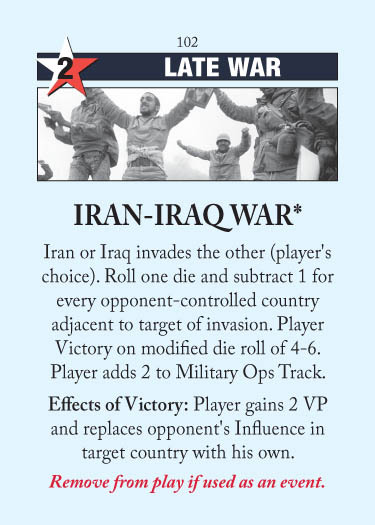 This entry was posted in Late War, Neutral Events and tagged Iran-Iraq War. Bookmark the permalink. Iraq has another not mentioned here neighbor – Jordan. Jordan does not lie dormant like Gulf States. Can you clear what you meant? Technically, it’s exactly a 50% chance, and never greater, of 2 vps if your opponent does not control any neighboring countries.